28th May 2018, New Delhi: There has been major discontent among citizens about the health care services available in the country. Low quality of Government Healthcare and Private Healthcare’s approach of operating like a business first and ethics later has majority of the citizens across the country concerned. The government has been making some efforts to improve the healthcare facilities in India and new National Health Policy in 2017 after almost 15 years, is one such move. One of the priorities of this policy is to increase the healthcare expenditure by the government as a percentage of GDP from 1.5% to 2.5% by 2025. 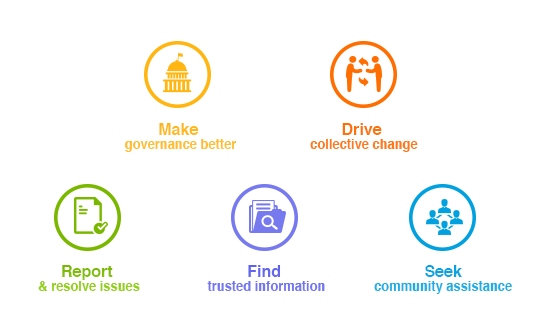 LocalCircles conducted various polls to identify what should be done to ensure healthcare reform in India. 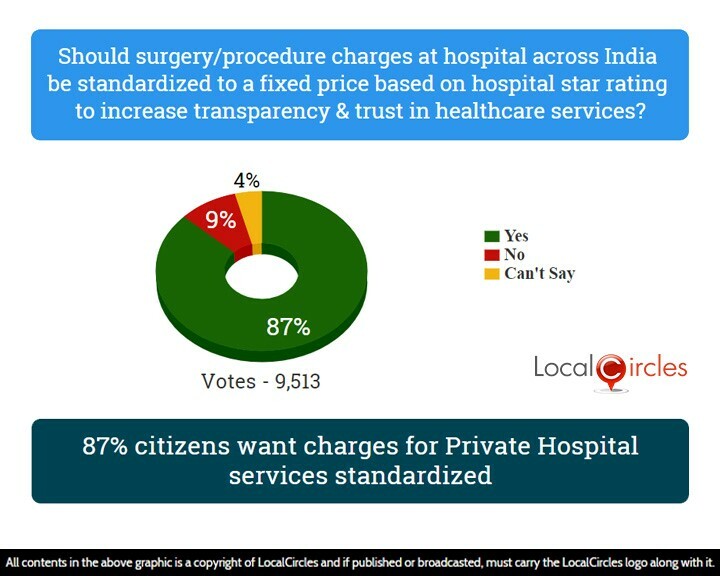 In the first poll, citizens were asked if surgery/procedure charges at hospitals across India be standardized to a fixed price based on hospital star rating to increase transparency and trust in healthcare services, 87% replied in an affirmative, with 9% declining and 4% not being sure about it. Many cases like children dying in a UP Government hospitals due to lack of oxygen, women giving birth outside hospitals and helpless patients waiting in the alleys of Government hospitals waiting to be attended by doctors have made headlines through the last few years. Citizens have a different set of issues with private hospitals where people feel that these are money making machines and many a times a patient is subjected to unnecessary surgeries, treatments and OPDs so everyone in the medical supply chain can meet their targets. This became evident in a recent case with a Gurgaon hospital where a - year old girl who died was billed some drugs and consumables at a profit of over 1700%. 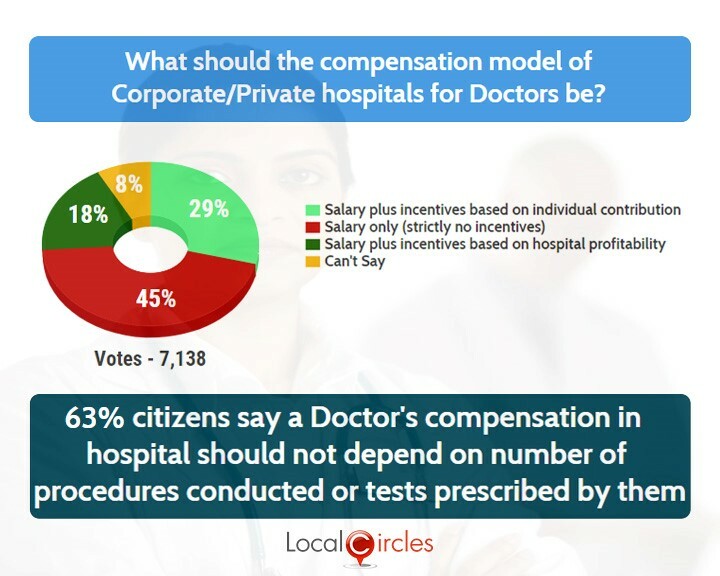 The second question asked what should the compensation model of private hospitals for doctors be. 45% said they should be on salary only with strictly no incentives, 29% said they should be on salary plus incentives based on individual contribution, 18% said they should get salary plus incentives based on hospital profitability and 8% could not decide how it should be done. Many citizens had reported that doctors are usually given financial targets by hospitals and are incentivised every month for achieving them. This leads the doctors to unnecessarily prescribe tests and medicines to the patients, thereby increasing their bills by many folds. Third poll asked how consumables should be used for a patient be billed by the hospital. 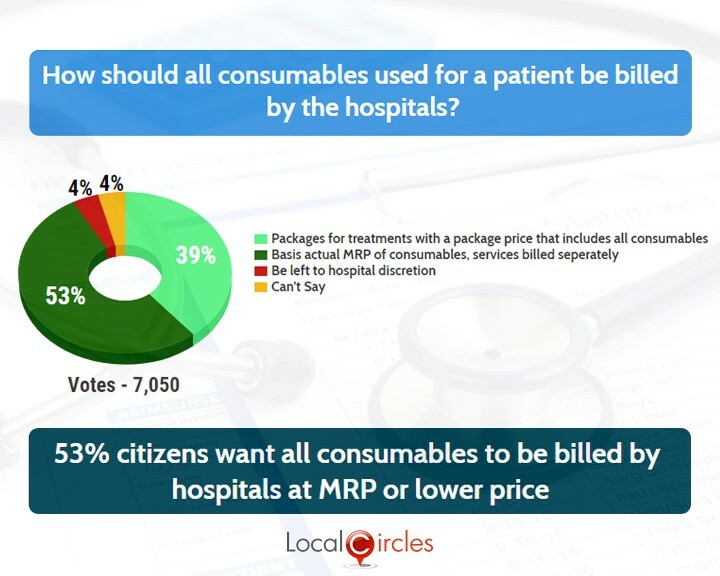 39% said there should be packages for treatment with a package price that includes all consumables, 53% said it should be basis actual MRP of consumables with services billed separately, 4% said it should be left on hospital’s discretion and 4% were unable to decide. In parallel polls 74% said that corruption related to procurement/supplies is a common phenomenon at government hospitals while 85% citizens had said they prefer to go to private hospitals instead of government hospitals. 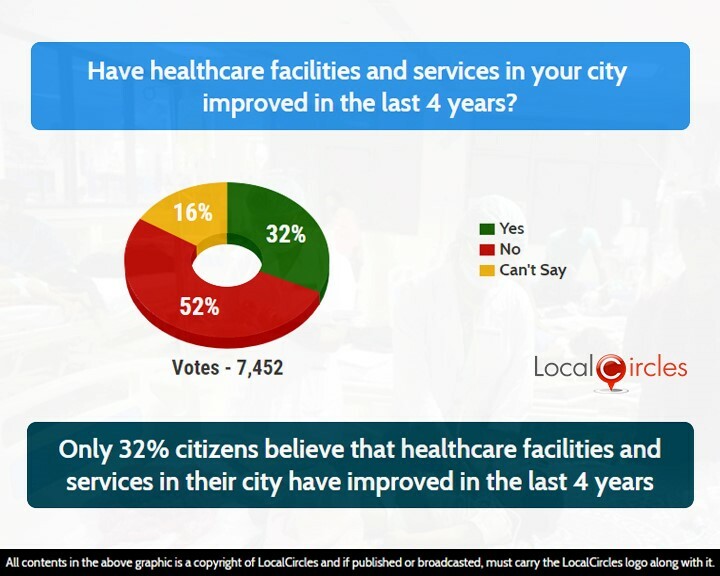 In the recent LocalCircles survey on 4 years of central government performance, only 32% citizens had said that healthcare facilities and services in their city have improved in the last 4 years whereas 62% said they have not improved. Union Health Minister JP Nadda had recently directed Chief Ministers of all the states to adopt and implement the Clinical Establishments Act, 2010 so that malpractice in private hospitals can be curbed. The Act that applies to registration and regulation of all clinical establishments will also help the government to monitor the diagnostic centres and pathology labs running in various parts of the country and make sure that they adopt the right standards.